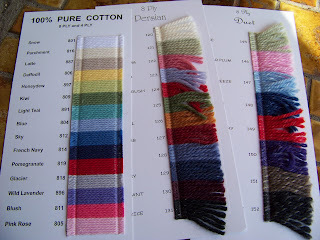 whilst slogging through my WIPs, I couldn't help but 'research' the interwebs for more inspiration or excuses, and on one excursion I found the wonderful world of Bendigo Woollen Mills online. The chances of me ever getting to Bendigo are pretty slim (although it is somewhat increased now that I know of Woollen Mills Factory Outlet). Aside from all the wool they are selling, they also sell cotton ... beautiful wonderful cotton. I don't often (read never) work with wool due to the climate and the fact that anything short of cashmere makes me itch. Their shade cards did not disappoint. What a wonderful range of colours! Thank you so much for the kind comment on the bread :) and I would love to hear how you get on with making your own yeast!